Look for mahi mahi with firm flesh and a fresh, oceanlike aroma. The sweetly flavored, firm flesh of mahi mahi makes an ideal canvas for a variety of seasonings and cooking methods, including blackening. Cooking this firm fish over high heat with a flavorful seasoning rub creates a main dish that requires minimal time -- meaning it's ideal for any day -- while packing a punch of flavor that makes it worthy of a special occasion. Is mahi mahi actually dolphin? The fish formerly known as dolphin fish got its name from its dolphinlike habit of swimming alongside boats. Consumer outrage resulted in a name change for this attractively colored, iridescent blue-green and gold fish. Seafood suppliers and fishermen renamed it mahi mahi, which translates to strong-strong in Hawaiian, to alleviate the confusion between the fish and the marine mammal. While your fishmonger can guide you regarding the exact amount you need, a typical dinner-size portion of mahi mahi averages 6 ounces per person. Look for fillets or steaks with firm, pinkish flesh. As fresh fish ages, its texture turns mushy and it develops dark markings. To keep the fish as fresh as possible, store it at 32 degrees Fahrenheit. Although this is significantly colder than most refrigerators, you can compensate by placing wrapped fish in a bowl or baking dish, topping it with ice and storing it at the bottom of the refrigerator. If you buy frozen mahi mahi, thaw it under cold water or in the refrigerator for several hours to avoid rapid temperature changes that can cause spoilage. The powerful punch of flavor associated with blackened mahi mahi -- or any other blackened food -- comes from a combination of the high heat cooking method and the complex spice blend used to season the fish. As the mahi mahi cooks, the heat toasts the spices to create deep, rich flavor. There are a variety of pre-made, commercial blackening season blends available, but you can easily make your own by combining 1 tablespoon coarse salt, 1 tablespoon onion powder, 1 tablespoon paprika, 1 tablespoon garlic powder, 1 tablespoon dried oregano, 2 teaspoons ground white pepper, 2 teaspoons ground black pepper, 2 teaspoons dried thyme and 1 teaspoon cayenne pepper. But food journalist and cookbook author Mark Bittman points out that you aren't restricted to only using blackening spice blends. Try using a single spice such as smoked paprika or curry powder to season the fish. The basic blackening method, created by renowned Cajun chef Paul Prudhomme, involves heating a cast-iron skillet over high heat or under the broiler until the pan is white-hot. Because this method produces plenty of smoke, be sure to have an exhaust fan turned on to high setting. Once the pan is hot -- usually within within 5 to 10 minutes -- brush both sides of the mahi mahi with butter or olive oil. Then, dip both sides in the blackening seasonings and cook the fish for approximately 3 to 6 minutes per side, or until the fish is white and flaky when you test it with a fork. The traditional method for blackening fish creates plumes of smoke, which can be a tricky prospect for novice cooks or anyone without a powerful exhaust fan. For this reason, grilling expert Steven Raichlen recommends blackening fish right on an outdoor grill. To do so, fire up the grill to high heat; clean and oil the grate to minimize sticking; and prepare the fish by rubbing it with a drizzle of butter or oil and a generous sprinkling of seasonings. 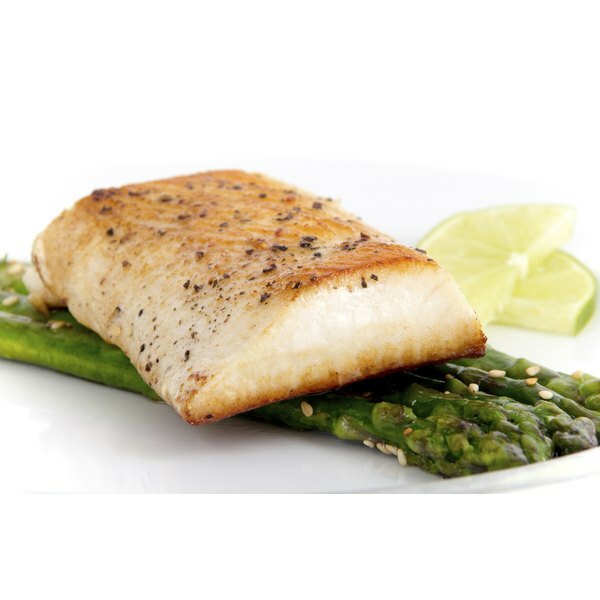 Grill the mahi mahi over direct heat for 4 to 6 minutes per side until the fish's flesh is white and flaky. Yet another option is to season the mahi mahi with a blackening spice blend and cook it using a conventional method such as baking, sauteing or broiling in the oven. Serve the blackened mahi mahi with a wedge of lemon and a cool salad for a refreshing contrast of flavors and textures.